Warlord Lo Cal is Back! and with the help of an army of pizza-loving mutants, he's attempting an extremely hostile takeover of Ninja Burger! Teenage Mutant Ninja Burger pits the honourable Ninja Burger employees against their toughest opponents yet - highly intelligent, super strong, pizza-toting mutant animals. As if that weren't enough, it provides rules for state-of-the-art security systems and heavily armed guards to the delivery location as well. 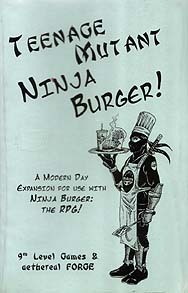 Luckily, Teenage Mutant Ninja Burger contains new equipment for use in today's hi-tech world and details on Wujenitsus that have been banned by the benevolent Ninja Masters. Combine all that with a new Ninja Sub-Clan, and you have the makings of one bodacious supplement!